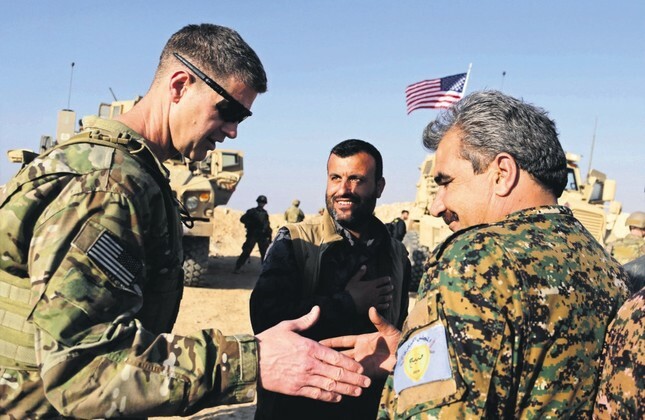 U.S. General Jamie Jarrard (L) thanks a YPG commander near the town of Manbij, northern Syria, Feb. 7, 2018. COLUMNS Iran: Regime change or renegotiation? The United States took a new step regarding its policy on Syria and the People's Protection Units (YPG) on Tuesday by offering rewards for information "leading to the identification or location" of three senior leaders of the designated terrorist PKK organization: Murat Karayılan, Cemil Bayık and Duran Kalkan. The next day, James Jeffrey, Washington's Special Representative for Syria, said that the United States did not consider the YPG, the PKK's Syrian affiliate, to be a terrorist group. He added that Washington "understood" Turkey's security concerns regarding the ties between the PKK and the YPG. The question is why the United States took this significant step and what it hopes to accomplish. There are several ways to answer that question. One could argue that the Trump administration intended the move as a goodwill gesture against the backdrop of the Turkey-U.S. rapprochement that started with the release of Andrew Brunson by the Turks. Others maintain that U.S. President Donald Trump wanted to clear the air before meeting his Turkish counterpart, Recep Tayyip Erdoğan, in Paris this weekend. The start of joint Turkish-American patrols in Manbij, along with the U.S. decision to grant a waiver to Turkey on oil sanctions against Iran, could be seen as proof of normalization – as the Turks expect U.S. authorities to show leniency in the Halkbank case. Another possible answer is that Washington wants to create some goodwill in Turkey before holding talks with the Turks on Iran's containment. Finally, one could make the case that the Four-Nation Summit in Istanbul turned all eyes east of the Euphrates river where Turkey is determined to conduct a military operation against terrorist groups. To be clear, those are all reasonable – and partly correct – answers. Yet the main reason behind Washington's most recent decision is hidden in the continuity of U.S. policy on Syria and the YPG. In this sense, U.S. policy hasn't changed at all. Instead, the time has ostensibly come for Washington to move to the next stage. Here's why: Despite making all kinds of promises to Turkey, President Trump has failed to reverse his predecessor's partnership with the YPG militants. U.S. officials have been trying for years to clearly separate the YPG from the PKK to transform it into an American proxy on the ground. In this sense, the Americans desperately want to prevent the YPG from being branded as a terrorist organization by severing its ties from the PKK. In addition to legitimizing the group, this policy would made it possible for YPG militants to have a seat at the negotiating table. The first step that the U.S. took in this direction was to bring together YPG militants with a small number of Arab forces under the umbrella of the Syrian Democratic Forces (SDF). The next step will be to clearly separate the YPG from the PKK once the fight against Daesh is officially over – so that the YPG can pretend to be the legitimate representative of Syrian Kurds. The only way for the United States to reach that goal is to take out the PKK's senior leadership. It is no secret that the organization's leaders in the Qandil mountains maintain close relations with Iran. In this regard, decapitating the leadership would present Washington with an opportunity to gain total control over PKK affiliates in Iran and Syria. Provided that the Turks have been carrying out airstrikes to take out the PKK's senior leaders, accomplishing this task will be quite easy for the United States. Yet the State Department's most recent decision is designed to appease the Turkish public, as the U.S. will launch an international charm offensive on behalf of the YPG militants. To be clear, European governments will voluntarily jump on the YPG bandwagon as well. Hence, the increasingly popular question with regard to who will speak for Syrian Kurds in the future. We cannot rule out that supporters of this plan will even invent a new umbrella organization to send the message that the YPG has indeed changed – that the group has completely detached from Turkey and evolved into a "Syrian" organization. The idea that members of a 40-year-old terrorist organization can just reinvent themselves overnight is absurd. It is no less laughable that the Americans think they can sell Turkey on a plan that Washington would not consider in the case of al-Qaida or the Nusra Front. Make no mistake: Ankara will never allow the YPG, or whatever the Americans intend to call it in the future, to represent Syrian Kurds at the negotiating table. The Turks would rather look for ways to eliminate the PKK/YPG presence in northern Syria – even if it takes decades. Nor is Turkey intimidated by the prospect of a U.S. withdrawal from northern Syria – a threat that Washington's messengers have apparently dangled before the Turks. Nobody takes seriously the claim that the U.S. will leave Syria anytime soon. Even if the Americans were to leave, Turkey has the political and military power necessary to eliminate the YPG and create a new order that reflects the area's demographics.